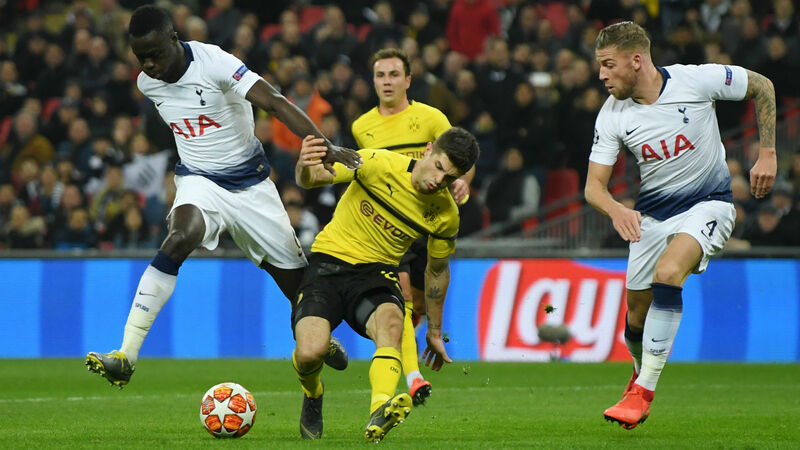 Borussia Dortmund attacker Christian Pulisic is not giving up hope of progressing in the Champions League, despite the German side losing 3-0 in the first leg of their last-16 tie with Tottenham. Dortmund travelled to Wembley on Wednesday for their first meeting and looked set to guarantee a tight tie on the evidence of the opening 45 minutes. Jadon Sancho was a particular threat for the Bundesliga leaders, impressing with his close dribbling and dazzling the Spurs defence. But after half-time Dortmund were blown away – Son Heung-min making the breakthrough with a volley from Jan Vertonghen's cross, before the Belgian and Fernando Llorente added further goals towards the end. It leaves Dortmund up against it ahead of the return match in Germany on March 5, but Pulisic – who had little impact on proceedings at Wembley – is confident Lucien Favre's men are not out of the tie. When asked if he still had belief, Pulisic told reporters: "Of course. This team's going to believe until the end. "We're going home now, there's no reason why we can't score three goals at home. We've done it before. "We've just got to go and we've got to be positive and go in with a good mindset into that game." But for Spurs, their second-half performance and result against a side such as Dortmund is a timely boost going into a crucial period of the campaign, according to Hugo Lloris. "At this time of the season, this kind of performance gives you a lot of confidence for the rest of the season," he said. "Especially as we're entering a really important period for the club, where everything is played, and playing like that against Dortmund, it's very good for confidence."